When selecting new additions for the perennial garden it is almost impossible to find one that will provide year round interest. This difficulty is further compounded when you need a shade-loving perennial. Well, what was once considered impossible for a perennial is now possible with the Helleborus! 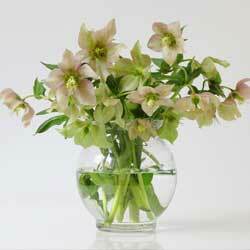 Although there are many species of Helleborus, the most popular is the Lenten Rose (H. orientalis). Bred especially for its unusual range of color, this cultivar is a low maintenance, long blooming, shade loving, evergreen perennial. The neatly mounded form of the Lenten Rose grows approximately 12-24” high by 18-24” wide. The nodding flowers of H. orientalis resemble a single rose and are about 2-2.5 inches across. They are available in range of colors that include white, cream, lemon, chartreuse, lime, pink, rose, maroon, plum and almost black. Many varieties can even be speckled. Flowers appear in early to mid-March, while most other perennials are still sleeping, and last well into May. This plant has the unique ability to bloom in freezing temperatures often with snow still on the ground. The Lenten Rose boasts a large, glossy, leathery, evergreen, compound leaf. Each leaf is made up of 7-9 serrated leaflets borne at the end of the leaf stalk, producing an umbrella like effect. This perennial works well near a walkway so that it can be easily enjoyed before the garden season even begins. Elevate the plant for a better view of the face of the nodding flowers. Use all Helleborus as specimens in a small garden or near a pond, in mass as an evergreen groundcover or to provide textural contrast in the mixed border. At home in a woodland garden, Hellebores work well with hostas, ferns, brunneras, snowdrops, pulmonarias and winter aconites. It can be attractive surrounding a tree, tucked next to a deck or in a rock garden. Hardy in zones 4-9, Helleborus orientalis grows best in heavy to light shade. It prefers moist, well-drained soil, rich in humus and organic material, and is pH adaptable for a wide soil range. Tolerant of summer heat and humidity, the Lenten Rose is adaptable to drier soils, and competes well with tree roots once it is established. Mulch well to retain moisture and fertilize in early spring before the flower stalks begin to lengthen. By the end of the winter, leaves can often become tattered or scorched. Simply cut off any unsightly leaves and fresh new leaves will soon replace them. If you wish to divide H. orientalis, do so in the late summer to early fall. Make sure that you dig a generous root ball and provide plenty of water until established. The Hellebores do not like to be disturbed and are slow to recover when moved, so be gentle. Helleborus orientalis may be propagated from seed, however, seeds take six months to germinate and the young plants take three years to bloom so patience is essential – but well worthwhile for the stunning results. Hellebores are not prone to any pest or disease, and these plants are deer resistant. The flowers of this Hellebore are light green, and the evergreen leaves are more deeply lobed and sharply serrated than those of the Lenten Rose. The flowers of the Stinking Hellebore are said to be slightly malodorous. Similar in appearance to the Lenten Rose, this Helleborus must be vegetatively propagated and blooms earlier in the season the Lenten Rose. It can be a great option for extending the blooming season in your shade garden. No matter which Helleborus you would like to try, you’re sure to love the results when you add these shade-loving perennials to your landscape.